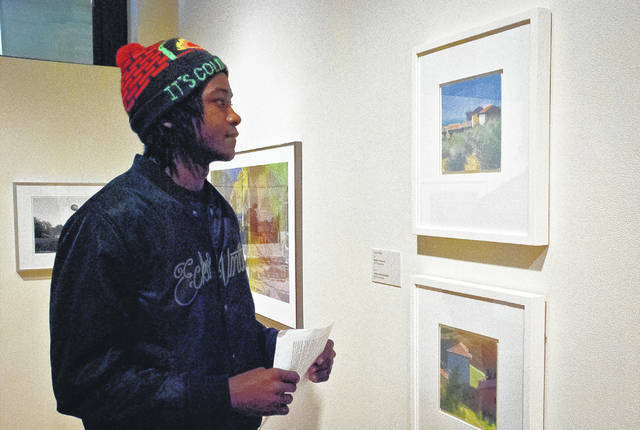 Zion Sims, like many Ohio Wesleyan University art students, walked around in the Ross Art Museum Wednesday in search of the piece of art to feature in his first art history paper. Zion said the professor was asking for a visual analysis and what the artist’s intent was for creating the piece. The Ross Art Museum is displaying Ohio Wesleyan University’s biannual faculty fine art exhibition through March 30. The gallery is a display of the inspirational works of Kristina Bogdanov, David Bugay, Cynthia Cetlin, Frank Hobbs, James Krehbiel, Jeffery Nilan and Jonathon Quick. Wallace said the exhibition gives art students a chance to view the art of their professors. She said most of the artists displayed live in Delaware with the exception of one or two, but they do live in the central Ohio area. “The biannual exhibition of faculty is so art students get to see what the faculty do in terms of their own practice,” she said. Wallace said the faculty chooses the pieces to display in the exhibit. Wallace said her job is to create a flow to the exhibitions she hangs. She said when she is picking out a show, she picks out artists that she knows will work together. Wallace said the museum is a learning space and resource where art theory becomes practice for the students, faculty and community. She said the professors send students to study the work of not only the faculty, but the galleries of other artists on display. The museum’s permanent collection includes the photographic works of Ansel Adams, Alfred Stieglitz, Harry Callahan, Edward Weston and Ralph Gibson; paintings of Terrence LaNoue and Randall Tiedman; sculptures by Jackie Ferrara and David Hays; fine jewelry creations by Robert Ebendorf; and the ceramics works of Pablo Picasso and Andrea Gill. Wallace said the permanent collection totals between 2,500 to 3,000 pieces. She said the collection is mostly photographs and prints with only a few pieces of sculpture. When the 1911 building was renovated to become the museum there wasn’t much space left for storage. This entry was tagged delaware, ohio, ohio Wesleyan university, Ross Art Museum, Tammy Wallace. Bookmark the permalink.